Welcome to Wireless Warehouse Tech Spot. Here we will showcase many of the hard to fix repairs with proven solutions our skilled technicians have completed successfully. Our technicians are level 3 and Level 4 which means they specialize in major board work including IC repair, Re work, and rebuilds. If you are the unlucky one that went to another repair store to have your smart phone or tablet fixed and were unsuccessful. Give us a try and we’ll make it right for you. Wireless Warehouse has stores in Windsor, Ontario, London, Ontario and Toronto, Ontario. 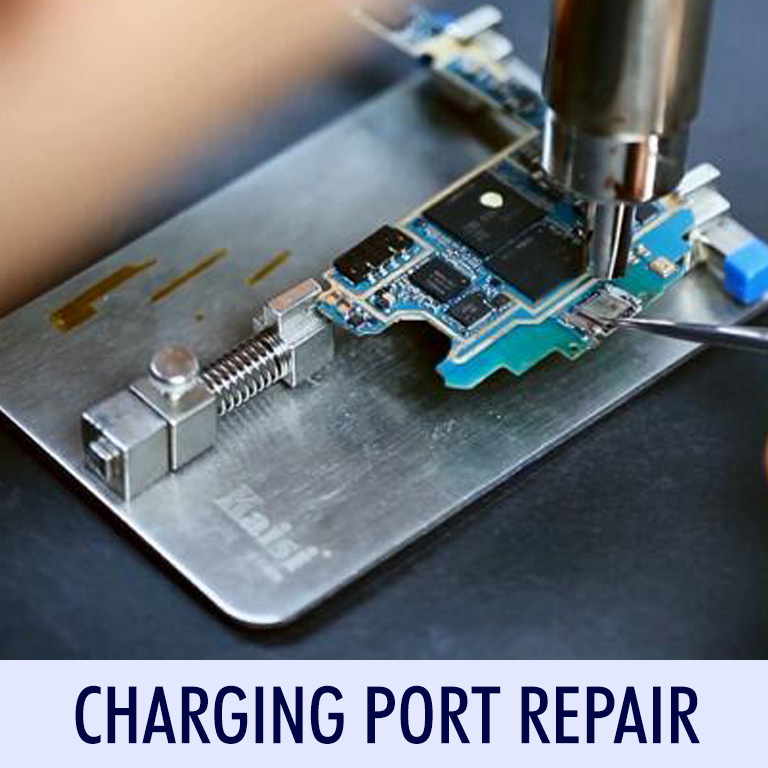 Charging Port repairs are very common. Due to the nature of how you handle your phone’s charging, over time the charging port will get loose and wear out. That’s where we come in! Our Technicians at Wireless Warehouse can replace your charging port with a new one. We are proud to stock all of the most commonly used charging ports, stocking more than 100 different make & models. The sim card tray and sim reading pins are very delicate types of hardware. Inserting incompatible and ill-fitting sim cards in your sim card tray can ruin and damage them. Wireless Warehouse can easily repair and replace your sim tray with high quality parts, ensuring that your mobile device will work perfectly! Phone or Tablet Shorting Out, Battery Not Holding a charge, Audio Issues, Charging Issues, Touch or Display Issues, Overheating, Turning Off and On Randomly. The IC Board or the chipboard is the brain of your mobile phone. It controls most, if not all, of your phone’s functionality; from your LCDs touch response, to even your phone taking a charge. 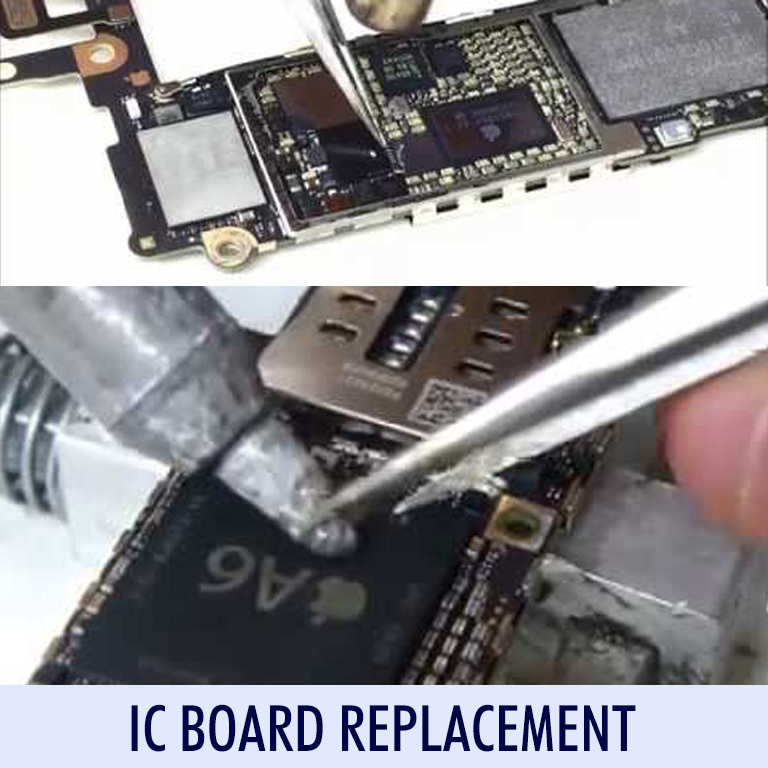 If your device needs its IC board replaced, we can accurately determine the cause of the problem and make the appropriate repair or replacements. You can see in the pictures (beside) that the repairs are extremely difficult and takes a skilled technician to perform. 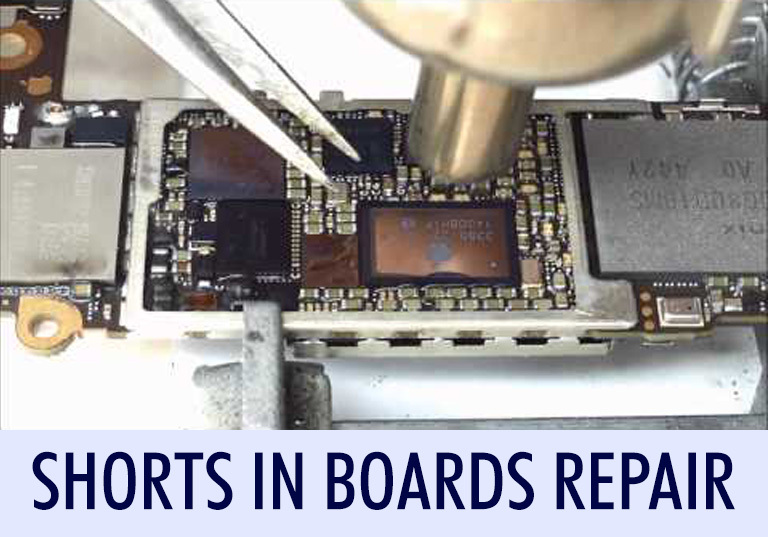 Wireless Warehouse is proud to be one of the only Repair Facilities in Canada who can perform such repairs. 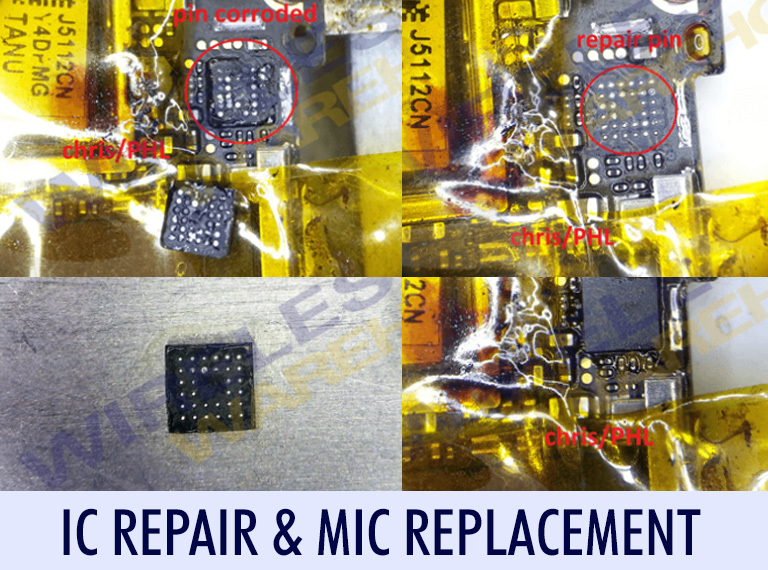 The pictures are showing the iPhone 4s which came in for repair with a bad MIC. Even after replacing the MIC, it was still faulty, which resulted in a short in the phone’s board. After tracing the short, Our technician was able to repair the IC and replace the MIC so it could work. This type of repair is extremely hard and only a Level 3 Technician with years of experience can complete this repair successfully. Our Technicians can replace broken Batteries, Digitizers, and LCD Connectors on the boards. If someone broke your connectors by mistake, or due to daily wear and tear, Have no fear! Our experienced and certified technicians can replace your connectors and restore your device’s functionality! 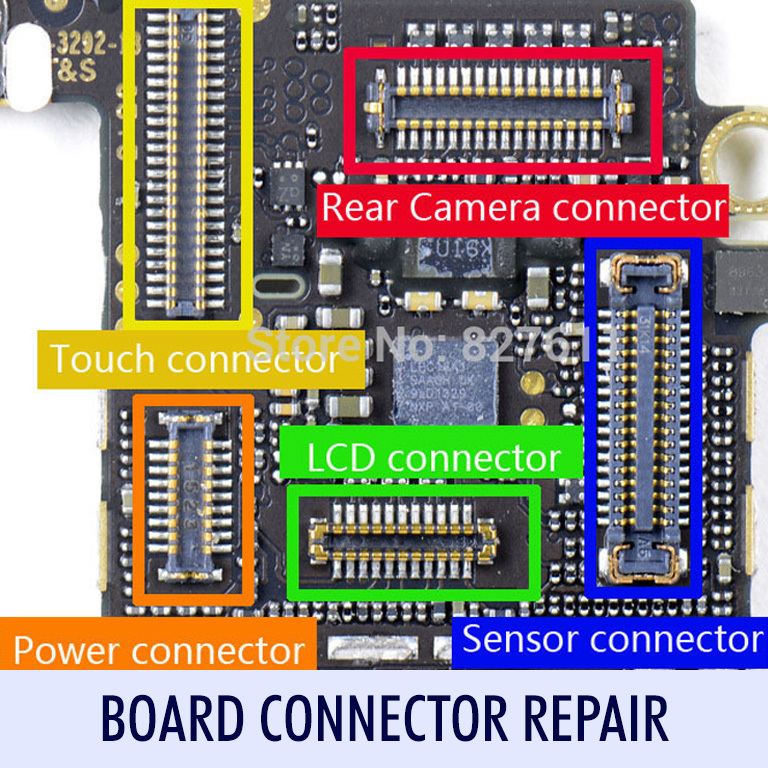 Replacing board connectors are generally extremely difficult to fix. Rest assured our technicians are trained and ready for the job. Our Technicians can help in retrieving deleted files or images that may have been deleted intentionally or by accident. Many people dread upgrading to a new device because of the hardships they have to go through transferring file from their old devices to the next. Let Wireless Warehouse fix your problem for you. Having added protection and insurance is great – break your phone and you can get it fixed or replaced for free. Problem is, you lose all your data in the process. Bring it to Wireless Warehouse! We’ll temporarily replace your LCD so we can recover your files – all of which will be available on a USB flash drive, that you can then use to transfer the files to the new or newly refurbished device. Contact Wireless Warehouse TODAY for a price quote. With today’s technology, softwares get updated and released faster than you can make pancakes. These softwares are vital for your device’s operation, but can easily cause issues if not done or handled properly. Some softwares can’t be upgraded without a custom root. Wireless Warehouse uses industry standard Mod Tools to root your device, so you can upgrade to the latest firmware that your device needs. For your ease of mind, let us help you with your Android phone today. Wireless Warehouse’s skilled and trained technicians can safely remove most Google Android Locks that are placed on some devices. If you have locked yourself out of your Google and Android accounts, Wireless Warehouse can help remove your Google Lock passwords so you can use your device as a fully-functional device again. We can even program devices to be compatible with Freedom Network – which do not have the AWS Frequency of 1700/2100. Our technicians can load the software for the following Samsung Models: Samsung Galaxy S4, S5, S6, S6 Edge, S7, S7 Edge, Note 3, Note 4, and Note 5. 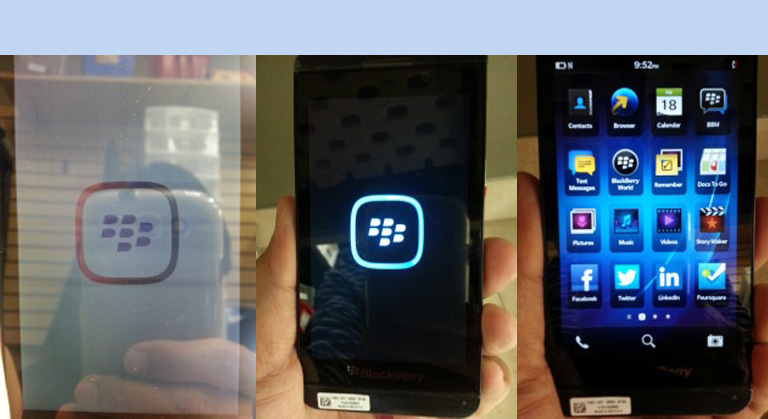 Wireless Warehouse specializes in all Mobile Phone Unlocking Solutions. If your Cellular Phone can be Unlocked, we are the ones who can do it. We have the latest tools and resources to allow us to unlock your phone regardless of carrier, software version, and other variables that could prevent a DIY unlocking – even if it is rooted! Our technology allows us to unlock rooted devices with ease, sans unlock codes. We use software solutions by directly connecting to the device and removing any carrier blocks, which allows you to use your phone with any carrier that your phone is compatible with. Whether you are switching providers or Travelling, having an unlocked phone is extremely convenient, helping you save hundreds in roaming and regular fees. Here at Wireless Warehouse, we treat our customers’ time as ours, so we make sure that you get maximum convenience. With our reliable mail-in services, you don’t have to worry about making time and effort in coming directly to our store. It’s very simple! Just fill out our mail-in repair form and send it to us. Once you have received your quote, you can send it to us. Don’t worry, the return shipping to you is FREE. Once you have sent in your devices, our experienced and certified technicians will appraise your devices, and send you a confirmation with the latest quote. Once accepted, all you have to do is to finish your payment through PayPal, sit and relax, and wait for your fully functioning devices to be sent back. All of our repairs come with a 90-day warranty. Wireless Warehouse is your #1 provider for New and Refurbished Tablets. We pride ourselves on having the selection of tablets that meet your company’s criteria! Whether you need it for work or pleasure, and whether you need Wi-Fi, 3G, 4G, or LTE capable Tablets, we have all the options available at the best prices. More and more Android Mobile Phones are being used at the workplace. Often, many companies are expanding their phone systems to be more streamlined and cost effective by using the VOIP Platform. In doing so, Many VOIP platforms allow Mobile Phones to connect to the system using WIFI and integrate to the phone’s system. Wireless Warehouse is proud to announce that we are a direct supplier for Unlocked Smart Phones – both Android and iPhones – which can easily be added and configured to your company’s VOIP Platform. For Any Questions, Contact Us Today!